Joseph Melançon is a versatile artist whose range of work includes watercolor, acrylic and oil painting as well as collage and sculpture. In his work he interprets lifelong interests such as antique toys, the American Indian, landscape and the figure using abstraction as well as expressive realism. 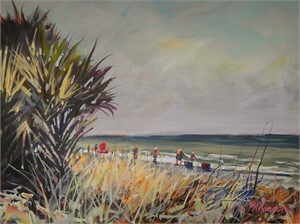 Joseph's works are very personal with a passion for process, composition and the painterly surface. In painting he dissects, simplifies and freely interprets what he sees and feels through the use of composition, shapes, line and color. Much of Joseph's youth was spent happily drawing, painting and building things. His time spent in later years hunting and exploring in the swamps and bayous of his native Louisiana proved to be a harbinger of his lifelong interest in the design and nature of the world. While majoring in Fine Arts at Louisiana State University Joseph's diverse interests and coursework also included music, stage craft, stage makeup, metal craft, welding and landscape architecture. At the Natural History Museum on campus Joseph was involved with planning and building native habitat dioramas. He competed with other colleges on the R.O.T.C. rifle team and the school archery team. Upon graduation from LSU Joseph left Louisiana and entered the museum field for six years designing science and history exhibits as Curator of Exhibits first for the Charlotte Children's Nature Museum and then the Fort Worth Children's Museum. Subsequently he was recruited to be a designer for Peter Wolf Associates in Dallas. After nine years with Wolf, Melançon opened his own studio in Dallas and for 21 years created props, sets, models and special effects for Ad agencies, industry, museums, zoos, film and television. After a creative and commercial career of more than 30 years, Joseph's education continued at Texas Woman’s University where in 2000 he received an M.F.A. in painting and drawing and was awarded membership in the National Honor society of Phi Kappa Phi for academic excellence. Joseph has additionally studied with many notable teachers including Ed Whitney, Frank Webb, Katherine Chang Liu, Tom Lunch, Marbury Hill Brown and Leo Smith. He has taught painting, drawing and design at Texas Woman's University in Denton, TX, Eastfield College in Dallas, TX and State College of FL in Bradenton, FL. Currently residing in Sarasota, FL, Joseph continues to paint, teach workshops and private lessons, and marvel at the wonders of our world. He’s included in Who’s Who Among Students in American Universities and Colleges, Who’s Who in the World, and the 1998 edition of the Guinness Book of World Records. 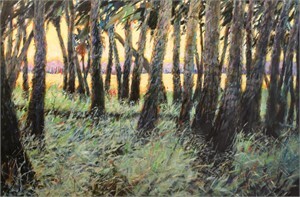 He is a Signature Member of the National Watercolor Society, Southwest Watercolor Society, Western Federation of Watercolor Societies and the Florida Watercolor Society. 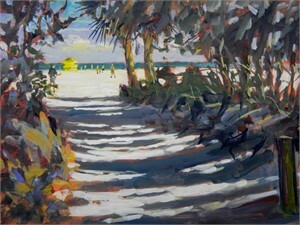 Joseph has membership in the International Society of Acrylic Painters-FL and Oil Painters of America. 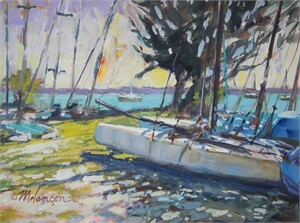 Melançon's paintings have been widely exhibited in the United States and won many awards including in the National and American Watercolor Societies annual shows and Best of Show in the Western Federation of Watercolor Societies. 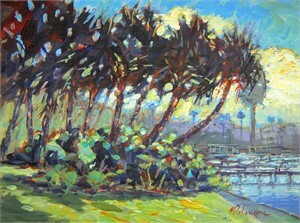 He was featured in American Artist Magazine, Splash 3 and 5, 200 Great Painting Ideas, and The Creative Edge. Joseph Melançon is a versatile artist whose range of work includes watercolor, acrylic and oil painting as well as collage and sculpture. In his work he interprets lifelong interests such as antique toys, the American Indian, landscape and the figure using abstraction as well as expressive realism. 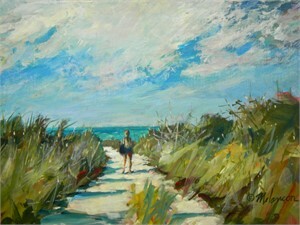 Joseph's works are very personal with a passion for process, composition and the painterly surface. In painting he dissects, simplifies and freely interprets what he sees and feels through the use of composition, shapes, line and color. Much of Joseph's youth was spent happily drawing, painting and building things. His time spent in later years hunting and exploring in the swamps and bayous of his native Louisiana proved to be a harbinger of his lifelong interest in the design and nature of the world. While majoring in Fine Arts at Louisiana State University Joseph's diverse interests and coursework also included music, stage craft, stage makeup, metal craft, welding and landscape architecture. At the Natural History Museum on campus Joseph was involved with planning and building native habitat dioramas. He competed with other colleges on the R.O.T.C. rifle team and the school archery team. Upon graduation from LSU Joseph left Louisiana and entered the museum field for six years designing science and history exhibits as Curator of Exhibits first for the Charlotte Children's Nature Museum and then the Fort Worth Children's Museum. Subsequently he was recruited to be a designer for Peter Wolf Associates in Dallas. After nine years with Wolf, Melançon opened his own studio in Dallas and for 21 years created props, sets, models and special effects for Ad agencies, industry, museums, zoos, film and television. After a creative and commercial career of more than 30 years, Joseph's education continued at Texas Woman’s University where in 2000 he received an M.F.A. in painting and drawing and was awarded membership in the National Honor society of Phi Kappa Phi for academic excellence. Joseph has additionally studied with many notable teachers including Ed Whitney, Frank Webb, Katherine Chang Liu, Tom Lunch, Marbury Hill Brown and Leo Smith. He has taught painting, drawing and design at Texas Woman's University in Denton, TX, Eastfield College in Dallas, TX and State College of FL in Bradenton, FL. Currently residing in Sarasota, FL, Joseph continues to paint, teach workshops and private lessons, and marvel at the wonders of our world. He’s included in Who’s Who Among Students in American Universities and Colleges, Who’s Who in the World, and the 1998 edition of the Guinness Book of World Records. 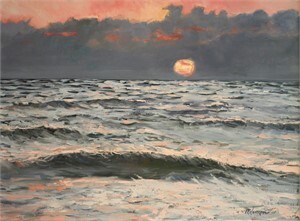 He is a Signature Member of the National Watercolor Society, Southwest Watercolor Society, Western Federation of Watercolor Societies and the Florida Watercolor Society. 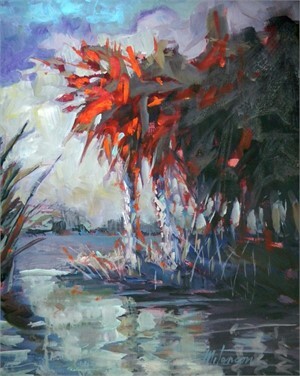 Joseph has membership in the International Society of Acrylic Painters-FL and Oil Painters of America. 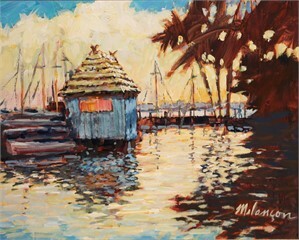 Melançon's paintings have been widely exhibited in the United States and won many awards including in the National and American Watercolor Societies annual shows and Best of Show in the Western Federation of Watercolor Societies. 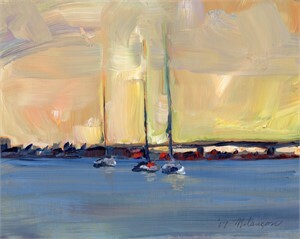 He was featured in American Artist Magazine, Splash 3 and 5, 200 Great Painting Ideas, and The Creative Edge.